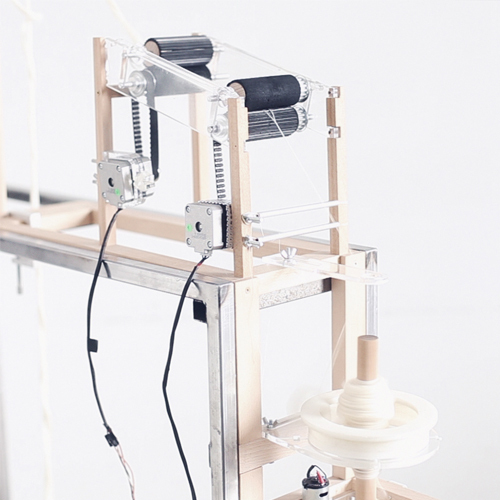 We are the Studio HILO from Berlin and developed the easy-to-build spinning machine HILO. Professionals and enthusiasts alike can use the open-source software and open source hardware to produce their personalized yarn, locally and on-demand, and if they prefer from old textiles. We will offer 2 hour workshop sessions (a few daily!) – where participants will walk along, code and get hands-on in their own yarn production. Take away your personally created yarn! The life cycle tour will start with the raw fibres (e.g. wool, silk and linen). We will walk through the yarn production process with the HILO machine and software (please feel free to code with us here!) and sit down cosily at the end – if you like – to knit with your self-spooned yarn. The workshop is for free but we would be thankful for a lot of feedback and ideas on how to improve the HILO machine/software for open source users. We would need a space of about 3x3 meters. For our material life cycle tour it would be great to have high tables of about (in total) 6 meters length. And an extra table with 4-6 chairs where we can put a laptop with WIFI (for coding) and material for knitting the self-made yarn. Participants are free to decide if they just want to do the “Yarn Life Cycle Tour” or stay for the Workshop. There is a limit of 6 people/Workshop – for the Life Cycle Tour it’s the more the happier. We are starting the research, so we don’t have more then our website/Vimeo videos from above. We would be happy to read anything interesting related to open resources and Studio HILO – just drop us a mail! Hey - You can also come already on Thursday with all your equipment. This gives us time to figure out how to set everything up for Fri & Sat. Hi Samira, thanks for the interest! We offer the workshops on Friday & Saturday at 10am, 12am, 2pm and 4pm – when would you like to join? thank you for your answer! I would be happy to join on Fr, at 4pm, if there is still a spot. Hey there! I’d like to join (only) the Lifecycle Tour on Saturday, 10am. See you there! Sure! See you there, Julia! "WORKSHOPS & BOOTH – Build, code and create your own yarn (Studio HILO)"
At what time (10, 12, 2, 4) would you like to join the workshop at Saturday? Hi Lani, you’re registered! See you at the workshop!